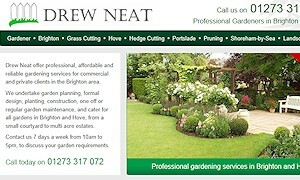 Drew Neat Gardeners, www.drewneat.com, started off looking after gardens, solely in the Crowborough and Rotherfield area. When we first started working with them, they initially tried to target clients in nearby Tunbridge Wells, East Grinstead, Sevenoaks, Tonbridge and Uckfield. This has been so successful, using our popular lead generator websites, that they are now expanding into Lewes, Brighton, Maidstone, Haywards Heath, Goudhurst & Hawkhurst. Being top of the search engines for people looking for a local gardener, is only half the battle. You then need to persuade people, that what you offer, is what they are looking for. Our proven expertise in local search engine optimisation and conversion analysis, has allowed Drew Neat to rapidly grow their gardening business across Kent and Sussex. If you think your local business might not be maximising it's online potential, get in touch for a no obligation chat. Email info@nwkmedia.co.uk today.